Arrival to Ivalo airport, transfer from the Ivalo airport to the Hotel (8 km). Check-in. Dinner in the restaurant. Delivery of thermal clothes (overall, boots, gloves). Free day for relaxing and shopping. You can also borrow skis, snowshoes, slides, kick-sledges from the garage free of charge. Enjoying the Lapp nature driving with snowmobiles along the river Ivalo, through the forest, over the lakes in variable landscapes. According the circumstances the route can vary. total duration approx. 2 hours (including briefing, delivery of helmets and the safari, driving approx. 30-45 km depending on group size and the skills of the drivers). Not for children under 12 years old. Driver is always responsible for damages of snowmobile up to 800 €. In bigger damages insurance covers the part, which cost more than 800 €. Meeting with The Husky Farmer who will pick you up from the reception in Hotel Ivalo and the huskies are waiting for you near by the hotel. After a short husky sledge driving school you will drive a husky safari (driving time approximately 45-55 min). Husky ride will be driven 2 persons / dog team (children under 15 years old will sit in the sledge). One is driving and the other one can sit in sledge. During the trip you can change places as driver and as passenger. Snowshoe walking trip with guide near the hotel and along/behind the river. If we are lucky we might observe some animal tracks in the forest, perhaps even see some animals. Total duration approx. 1½ - 2 hours, depending on weather and snow situation. In the evening meeting with guide and departure to search the Northern Lights with minibus. 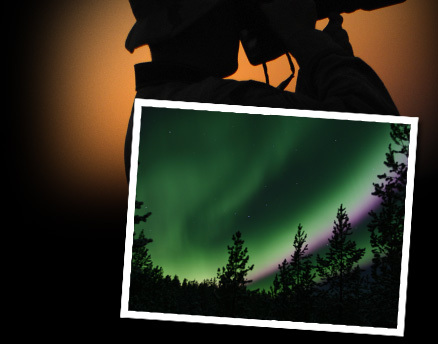 Our guide will try to find the best places to observe possible Northern Lights. Total duration approx. 2-4 hours depending on weather. Later during the night it's possible to be outside near the hotel by yourself to observe possible Northern Lights. In the evening meeting with guide and departure to search the Northern Lights with minibus. Our guide will try to find the best places to observe possible Northern Lights. Total duration approx. 2-4 hours depending on weather. Later during the night it's possible to be outside near the hotel by yourself to observe possible Northern Lights. Return of thermal clothes and check-out. Transportation to the Ivalo airport by bus. Note: by request we are able to rent some photography equipment, check availability. 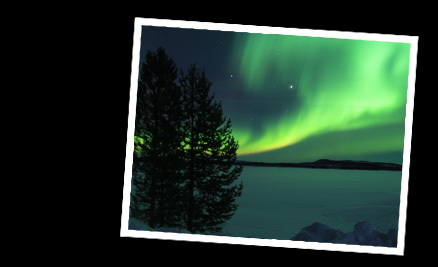 Combine different kind of Winter Activities and Northern Lights, Snowmobiling, Huskies, Skiing ect.